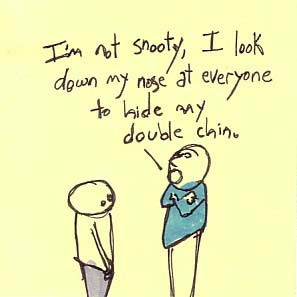 "I'm not snooty. I look down my nose at everyone to hide my double chin." From the series of Original Sticky Note & Webcomic Artworks by Francis Ledbetter, as drawn on standard Post-It © Notes, and as inspired by daily occurrences, chance encounters, and random media. Purchase this original sticky note artwork on evil t-shirts, unique beer steins, mean pins and much, much more! . I love your art and would be honoured if you showcased your works on my site. We have over 4000 artists which you can connect with, ask to like your facebook page and get inspired from. http://www.exportingart.com/ The site is a free social media art site! I love your hilarious cartoons on sticky notes...it's amazing! I was wondering if I could join your team. I have some hilarious ideas(good pointless fun). SquirrelJunkie.com celebrates the fine line between love & exploitation, envy & prejudice, adoration & stalking, beautiful & beauty, and good times & bad times. Tayappention.net - Compilation of the Funniest Stuff and Hottest Women on the Web Today!